DRAWING MARKERS. DRAWING PENCILS. DRAWING PADS. English & Spanish - 84 pages. ART ACCESSORIES. Featured in this issue are Katsu BTM, The NER Crew from Buenos Aires, Biz HCO and a photographer's report featuring Alex Fakso, Nils Müller & Edward Nightingale. 24 colour pages including editorial, BAMM news, general news & features. Vol CXLI No 3891. CARPENTER & BUILDER. 28 MARCH 1952. THE ILLUSTRATED. THE LARGEST CIRCULATION IN THE BUILDING INDUSTRY. TO THE BUILDING INDUSTRY. Computer Arts #85. Print Design Issue. - The very best new work from the global design community. For sale is the LEISURE PAINTER magazine from September 2002. The magazine is in very good condition. For sale is the LEISURE PAINTER magazine from June 2002. The magazine is in very good condition. 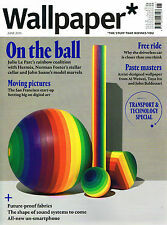 For sale is the LEISURE PAINTER magazine from February 2000. The magazine is in very good condition. BedHead CROP - The Sampler Issue BOOKLET, Spring 2011. Magazines (Fashion /Cinema /Music /Photography / etc). Excellent condition. 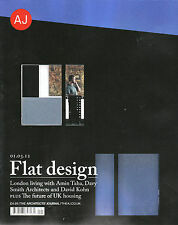 THE WORLD OF INTERIORS - OCTOBER 2010. High quality glossy magazine focusing on architecture and interior design. Magazine is in very good condition. 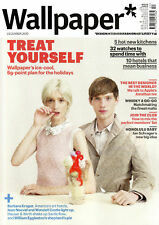 THE WORLD OF INTERIORS - DECEMBER 2010. High quality glossy magazine focusing on architecture and interior design. Magazine is in very good condition. It's in good condition; the edges of the pages show slight yellowing. The drawings on the inside cover are by Dylan Martorell. Condition: Very Good with a little very mild wear to cover only as shown. Be sure to add us to yourfavourites list ! Inside Stylefile #46, you'll find interviews with KAOS75, FACH, OTIS und JÜRGEN FEUERSTEIN, trains, walls and love sketches! DRAWING MARKERS. DRAWING PENCILS. DRAWING PADS. ART ACCESSORIES. GREAT GIFTS. Minimalissimo interviews Danish multidisciplinary studio Norm Architects, Swiss artist Zimoun, unisex fashion designer Rad Hourani, and Vitsoe managing director Mark Adams, who worked alongside the great Dieter Rams for more than twenty years. Vintage/retro "Design in Timber". Architects publication. Early 1960 s .
Vintage/retro "Design in Timber"publication.early 1960 s.good condition. Published by the Timber development association.not dated but probably early 1960 s.In good overall condition but there is brown staining on pages 8/9. [see photo 4]. 24 pages showing timber use in building construction. Imagine FX issue 104 from January 2014. Includes a link to digital art resources including brushes and tutorials. Great inspiration and learning tool for digital artists. 'FIND YOUR ART STYLE'. The 49th issue of the infamous Stylefile Magazine is here! DRAWING MARKERS. DRAWING PENCILS. DRAWING PADS. ART ACCESSORIES. GREAT GIFTS. MARKER STORAGE. COPIC AIR-BRUSHING SYSTEM. MAGAZINE OF THE AMSTERDAM FASHION INSTITUTE (AMFI). · AMIE DICKE. ANT is an independent fashion magazine that focuses on the celebration of absurd creative passion and features the pleasantly obsessed. EIKO ISHIOKA. THEO CROSBY, EDWARD BOOTH-CLIBBORN, DAVE TROTT. SUSIE FAUX on the cover. CREATIVE REVIEW Magazine, December 1984. IN THIS ISSUE DAVID FAIRMAN. Very Good condition (a sticker on the cover, otherwise - Excellent). For sale is THE WORLD OF INTERIORS magazine from December 2010. The magazine is complete and in very good condition for its age. For sale is INTERIOR WORLDS magazine for the year 2000, from THE WORLD OF INTERIORS series. The magazine is complete and in very good condition for its age. ISA GENZKEN. VENICE BIENNALE - GERMAN PAVILION. VOGUE SPECIAL ISSUE. 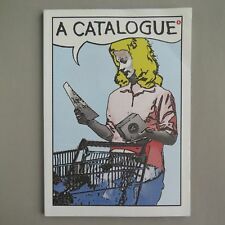 Includes Damien Hirst, Jason Rhoades, Brian Jungen, Terry Riley, etc etc. All in good used condition.